LAS VEGAS, Nevada, February 7, 2019 – Last year, Ontario’s Chris Littlemore became the second straight Canadian to take the NTRA National Horseplayers Championship (NHC) Presented by Racetrack Television Network, STATS Race Lens™ and Treasure Island Las Vegas. If Littlemore can repeat that spectacular effort this weekend at the 20th edition of the tournament, he would become the first in the history of the event to win the title twice. In the days leading up to this year’s NHC whirlwind, Littlemore shared his thoughts on how being the Horseplayer of the Year changed him and what he needs to do to make history this week. Q: How has winning the NHC changed things for you? Q: What was your mindset going into last year and heading into the final table? Did you ever feel comfortable with the lead you had? Q: How does your mentality for a tournament compare to the mentality you bring to a regular day at the races? Q: No one has ever won the NHC twice, much less gone back to back. How do you feel about your chances of being the first to do that? Q: How did you first get involved in horse racing? Q: How has the NHC as a whole changed things for horseplayers over the years? Whitby resident Littlemore became the second straight Canadian to win the NHC following a similarly dominant performance by 2017 champion Ray Arsenault of Thornhill, Ont. Looking to keep that win streak alive, Russ Wilkes, Gary Blair and Allan Schaffer are also among the Canadian contenders in this weekend’s tournament. Wilkes, a retired liquor store manager from Stittsville, Ont., has had an amazing amount of tournament success in a short amount of time since playing his first tournament in August 2016. Wilkes finished 40th on the NHC Tour this year and is a first-time NHC qualifier based partly on the strength of his victory in the Woodbine Spring Tournament on June 16. Toronto-based Gary Blair, who manages a five-pin bowling centre, finished 49th on the NHC Tour. He is a first-time NHC qualifier as well and regular Woodbine tournament player. Schaffer is a commercial real estate executive based out of Toronto and earned his first of many NHC berths after winning a Woodbine tournament back in 2005. He returns to take another shot at the championship title after finishing 92nd on the NHC Tour and posting a pair of second-place finishes in the Woodbine Mid-Summer Tournament on July 21 and the Woodbine Mile Tournament on September 15. The field of talented horseplayers also includes New York resident Nick Noce, who was named the 2018 Sovereign Award-winning Horseplayer of the Year for his successful tournament play at Woodbine. 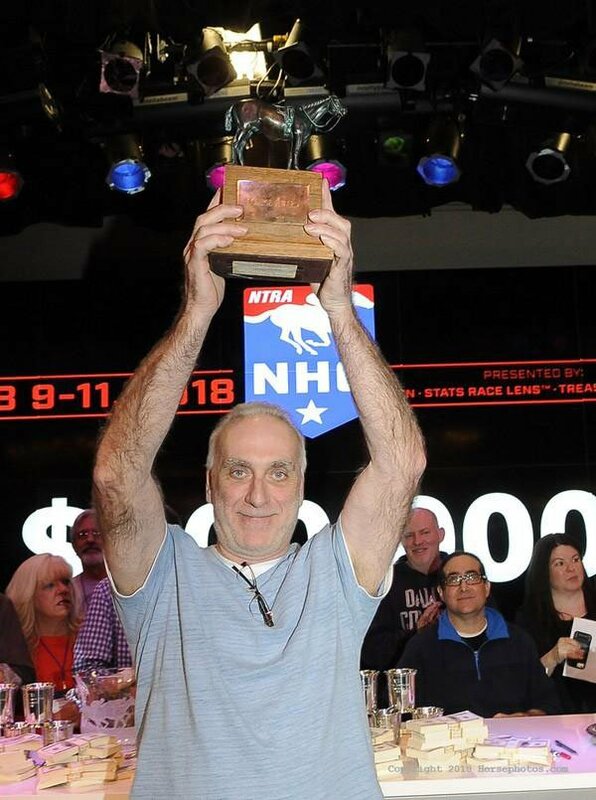 Other horseplayers competing in the NHC who qualified through Woodbine tournaments include Scott Carson, Louis Cavalaris, Jack Dicenso, Barry Kerbel, James Metzger, Anthony Peterkin, Ken Zelin and Tony Zhou. This entry was posted in Woodbine Insider and tagged Chris Littlemore, Handicapping Tournament, Horseplayer of the Year, Horseplayer Tournaments, National Horseplayers Championship, Russ Wilkes. Bookmark the permalink.